Twelve months ago, Karen Gibson was travelling around London giving workshops in gospel music, when she received a phone call which was to change her life – and the lives of her closest friends, the members of The Kingdom Choir. And in May, as HRH Prince Harry and the Duchess Of Sussex prepare to celebrate their first wedding anniversary – while adjusting to life as first-time parents – Karen and the choir will be embarking on their debut tour. 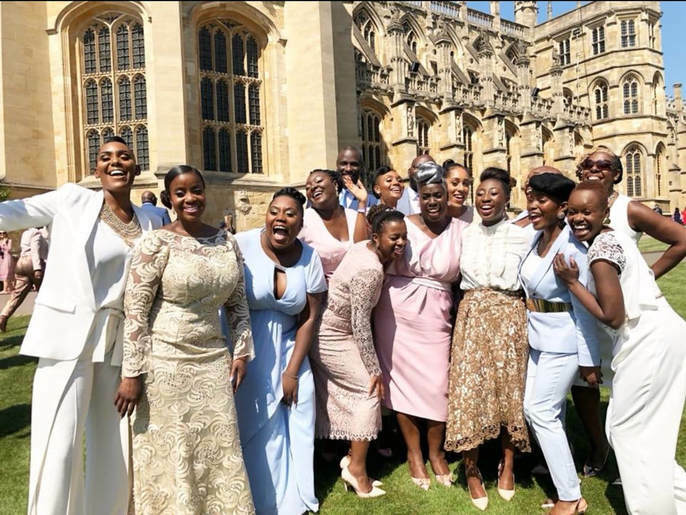 The Kingdom Choir’s stunning version of Stand By Me was a standout moment during the Royal wedding. The performance has been an internet sensation with more than 10 million views on YouTube. A former IT worker and music teacher, Karen Gibson formed the choir 25 years ago, drawing together singers from in and around London, from various Christian traditions. For their first two years together, the choir didn’t even have a name – it was only an invite to appear on the BBC’s Songs Of Praise which saw Karen decide on The Kingdom Choir. Karen has worked around the world as a gospel choir conductor, travelling as far a-field as Japan, Nigeria and the USA. 2018 was a whirlwind year for the choir, with TV performances on shows such as Good Morning Britain and alongside Madness for the BBC1 New Year’s Eve concert, releasing their debut album Stand By Me after signing to Sony, and closing the Invictus Games in Sydney. Now they’re preparing to take their musical message of ‘love, hope and inspiration’ on the road. We spoke to Karen Gibson about how life has changed and what’s next for the choir. Looking back, to this time last year – can you believe everything that’s happened? This time last year, I had absolutely no clue what was going to come. I was living my ordinary life; giving gospel workshops, teaching in schools, travelling to do those things. I was jumping on public transport, missing busses and trains, all just going about my life. There were some lovely things going on – a few of us had just filmed with Call The Midwife, which had been a lot of fun… Little did they know what was going to then happen to the singers they booked. It has been all change, and not without challenges, but it’s been a brilliant, wonderful blessing of a time. So how did it all start……..
That call didn’t come for a few days, and I’d put it out of my head. I was on a number 87 bus and a very posh voice came through on a call and said: “We would like to invite you to sing at the Royal Wedding”. I was so shocked I just said: “You’re joking.” They said absolutely nothing, so I knew it wasn’t a joke at all. It was so exciting to call all the choir members, even though I wasn’t allowed to say anything. I just had to make sure they were available on that certain date, and that maybe the date might ring a bell with them. One gentleman said he wasn’t available, and yes, I’m pretty sure he kicked himself when it emerged what was happening. Has the Royal Wedding experience changed the way The Kingdom Choir works? Oh, yes, it definitely has. When we went into the studio [to record the album] I realised we couldn’t do what we were used to doing; presenting gospel in that very full-on, in-your-face way. God showed me that you can bless people without being in your face, and that stripping it back can be very meaningful – it must be, people are still talking about that performance all these months on. I’ve realised we can reach more people by also take a different approach to our music. The couple’s [The Duke and Duchess of Sussex’s] version of Stand By Me was the one which caused our website to crash, for our Instagram following to go from 700 to 35,000 in one weekend. That taught me something; maybe it’s not always about doing what you do in the way you do it. In faith terms, that’s a huge lesson. How did you bring together the choir’s original approach with the new outlook to create the album? We chose songs we had previously performed, like Something Inside So Strong, a self-penned song from one of the members Chases, Amazing Grace and Hark The Herald Angels Sing. But then we also looked to songs we like, not necessarily from the Pentecostal realm, but songs we found inspiring and that carried a positive message. Golden, has the lyric “Living My Life Like It’s Golden”; I love that. And then something like To Make You Feel My Love, we turned it from being about a relationship love to a faith love. Now you’re getting ready for a UK-wide tour. How is that going and what can people expect from the tour? It’s all going very well and we are starting to put the show together. It’s going to feature songs from the album, and of course we’ve got to do Stand By Me. But it’s all very exciting. You’re going to get a bit more of The Kingdom Choir that people have heard or seen on the TV or radio, but in a more raw state - freedom, and love, hope and inspiration, as the album says. We’re really looking forward to making the connection with people – to see the people who’ve been listening to us, and to introducing gospel to people who maybe hadn’t experienced it before. Our music is powerful, moving and inspiring, people come in with one mindset and leave with another. The Kingdom Choir has selected local youth and children’s choirs to join them in each town or city they’re visiting on the tour. Are you looking forward to working with them? The choirs we’ve chosen really are very, very good, and it’s lovely to know there are so many singing communities out there. Singing is so good for our children – well, for everyone. From personal experience, I know what it can do for a person; it’s a skill for life, it builds confidence and it’s brilliant for them. I’m very much looking forward to connecting with the children and I hope we will impact on them in some way, through the power of music. It’s going to be really special and I love the idea of us spreading that joy to these groups. A lot of the choir’s members have worked in schools, so we have that connection with young people – some of the choir’s members are people I taught in schools or worked with in youth choirs, so it goes back a long way. A year on from where it all began, the tour will coincide with The Duke and Duchess of Sussex’s first wedding anniversary, what happens next for The Kingdom Choir? We just don’t know how it’s going to pan out – who could have predicted this last year? We are praying for longevity, we just want to impact the world for good. The album strap line is ‘Love Hope and Inspiration’, and I was thinking recently ‘hope’ is in pretty short supply right now, I feel the world is hungry for hope and good news – so we want to bring more of that about; that’s the long vision.